The iPad, much like the iPhone and iPod Touch, will run apps. Some will be specially made for the iPad. Here are the first few they've shown off. UPDATED: Here's our essential list, now that the store is open. This game, from GameLoft, is already available on the iPhone. But this new version gets new controls on the iPad, such as the ability to slide the D-pad around to where you want it, sliding two fingers across the screen to toss a grenade, and sliding three fingers to open a door. You can also draw a targeting box around groups of enemies to fire on them all at once. We expected this one, and it looks great. A lot like the Times Reader they've had available for a while, but more, you know, multitouchy. 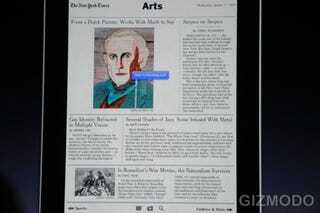 It looks pretty great, actually, much more like a newspaper than an app. This is a driving game (duh) that lets you use multitouch to tap inside the car and swipe up and down to change gears. You can also tap the mirror to look behind you. Looks pretty smooth. This lets you check out scores, stats, a weird animation of pitches and all sorts of other stuff while games are on. You can also watch live games, with your choice of home or away announcers. Looks pretty badass for baseball fans. There's also the new iWork suite and iBooks for readin'.